Some refer to it as "Yamo Gate". But reliably the name of this building I couldn't find out. All the Thais I asked don't seem to know either. It's not a historic building and was build in the early 1990s, when Korat was given a new face for the World Tech Exhibition, which then took place in 1995 on the grounds of Suranaree University. Anyway this building is one of the nicest to take photographs of. 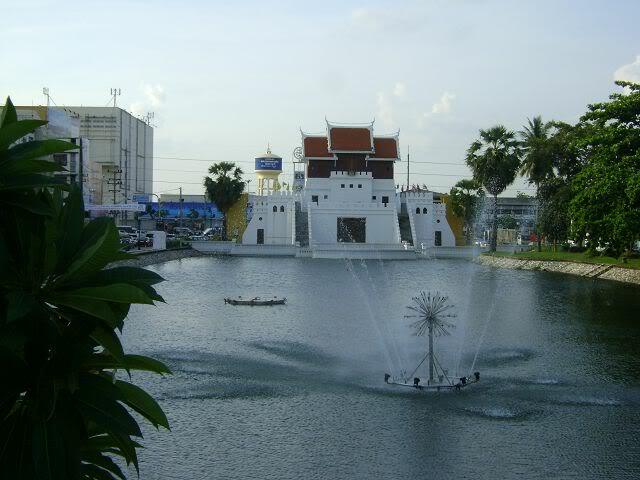 It is located at the end of the Western moat at the junction of Ratchadamnoen and Mitraparp Road. It is assumed that it stands in symbolic connection to the Suranaree Monument (Yamo) at the other end of the moat for the victory over the Laos Invasion which Thao Suranaree gets credited for.